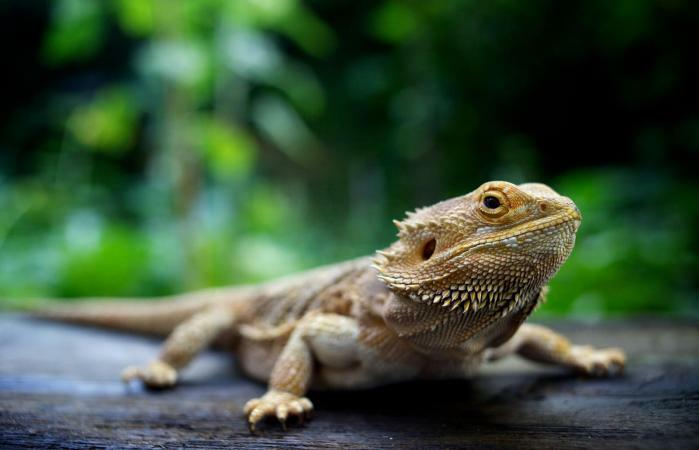 The most common bearded dragons kept as pets are the inland variety, but they can also be found in pet stores list as "central," "Pogona" or "yellow-headed" bearded dragons. These friendly Australian reptiles are yellow or tan, and they get their name from the way they can flare the skin at their throats. Bearded dragons are not high maintenance pets, but they do require regular care and the right setup. If you plan to keep a bearded dragon as a pet, you'll need a 10 to 15 gallon aquarium for juveniles and at least a 55 to 60 gallon aquarium for adults. Wire cages are not recommended because they don't hold the heat in the way an aquarium does. However, don't place the aquarium in natural sunlight as it can trap heat and cause your pet to die due to unnaturally high temperatures. Basic Environment: Their environment should include flat-bottom rocks, branches and a box or flowerpot to hide in. This provides a place to bask, climb and get away from it all. Lighting: Bearded dragons need full spectrum lighting with UVB. Flooring: The bottom of the aquarium should be covered in pet use-approved indoor/outdoor carpet, newspaper or fine playground sand. Items never to use include: Wood shavings, gravel, crushed corn cob and potting soil with vermiculite. Temperature: Bearded dragons are desert creatures, and their cages should be kept between 78 to 88 degrees Fahrenheit with nighttime temps in the 70s. Areas where your beardie basks in the light can be as warm as 95 to 100 degrees Fahrenheit. Plants: Plants make a nice addition to your beardie enclosure and help control humidity levels, but double check whether the plants you select are safe for bearded dragons before you place them in their habitat. Water should be provided in a shallow dish or through misting greens. Never feed them iceberg lettuce. Never feed them fireflies because they are toxic. When feeding strawberries, the seeds must be removed. The bearded dragon's tail is almost as long as its body. They flare the skin on their throat area when threatened or feeling territorial. This ability makes them look bigger. Spines grow on their throat, sides of the body, and the head. Male adult beardies usually have bigger heads and more prominent, darker beards than their female counterparts. In the wild, endangered bearded dragons often stand on their hind legs to run from the threat. 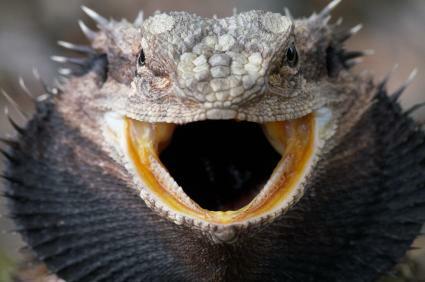 When bearded dragons are sick, their back often changes to a black color and their legs become light yellow. Adult males can grow to be two-feet long (this includes the tail). One important fact to consider when buying a bearded dragon for a pet is how long they live. The average lifespan is five to ten years, so purchasing a beardie is a commitment that should not be taken lightly. These reptiles make unique, friendly pets and need a minimal amount of care. However, they'll need that care for their entire lives, so be sure you're making a commitment you're prepared to live with.